Update: The Panasonic DVX 200 kind of blew us away, so be sure to check that camera out as well. What are the best cameras for documentary filmmakers in 2019? The last several years have brought us several years of technology advances bringing high-quality cameras to even lower price points than ever. 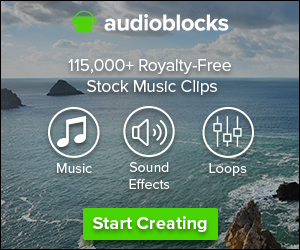 More documentary filmmakers are shooting on DSLR-like cameras, and the traditional video cameras available for documentary filmmaking today are better than ever as well. And new hybrid cameras are combining the benefits of both. 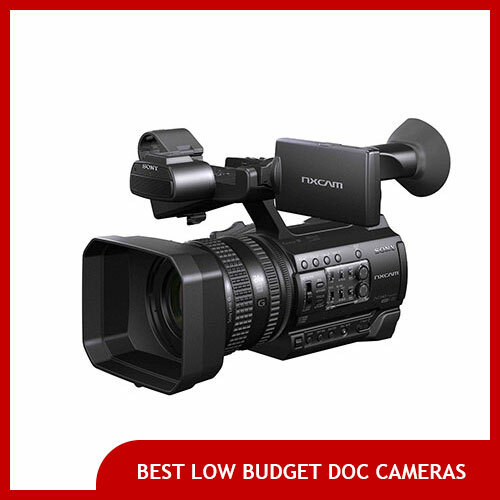 Here is our list of the best documentary film cameras, sorted by category. From our point of view, a professional traditional video camera is a video camera has a motorized zoom, XLR audio inputs, and is usually ergonomically set up for run and gun style shooting (this means handles, hand grips, etc). In the last ten years, there has been an explosion of high quality traditional professional video cameras that are appropriate for documentary filmmakers even with tight budgets. 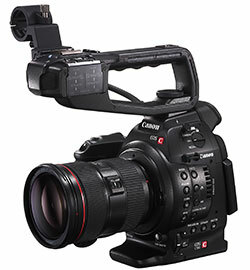 The Canon C100 (and its bigger and more expensive C300 brother) is a formidable documentary filmmaking camera. It combines Canon’s professional EF mount lens lineup, with XLR inputs and flexible articulating LCD screen and a handgrip (and a handle too for that matter). 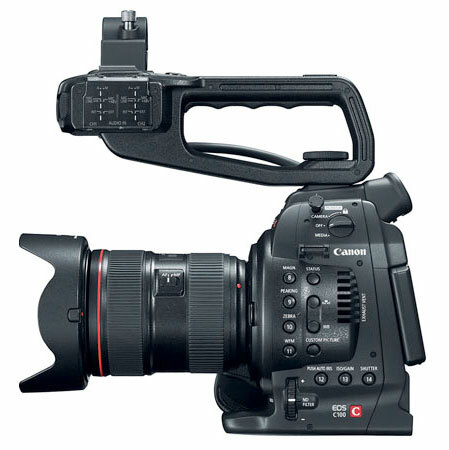 The C100 shoots up to 1080p in AVCHD on SDHC while its bigger brother, the C300 shoots MPEG-4 up to 4K on either SD cards or Compact Flash cards. 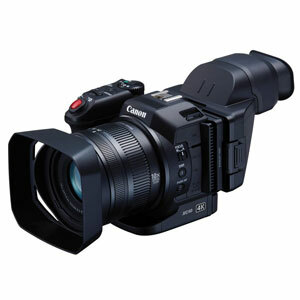 Unlike DSLRs, these cameras also feature HDMI output ports like traditional video cameras, allowing you to hook up larger external monitors or even solid state media recorders like the Atomos Ninja, which allows you to record straight in formats like ProRes 422 with better very little compression and higher color accuracy than AVCHD. The accessory ecosystem for the C100/300 is already well developed and these cameras are even popular among narrative/fictional indie filmmakers, so you can be sure it will be well supported for quite a long time. Our pick for the best traditional video camera for documentary filmmakers is the Sony PCW-FS5. 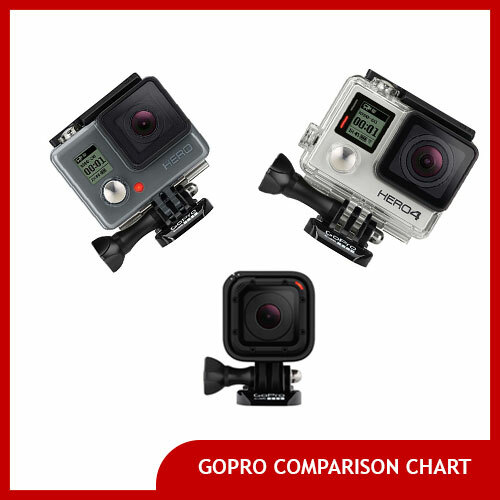 It offers 4K resolution and can also shoot at high frame rates of up to 240 fps at full HD for gorgeous slow motion footage. The FS5 comes with a generous 18-105mm zoom kit lens but you can also swap it out for any other Sony E-Mount lens you’d like to. Unlike a lot of other traditional video cameras, it’s also light, weighing only 4.9 pounds with lens, meaning if you’re trekking in the Himalayan mountains for a nature documentary you won’t be regretting choosing it. The FS5 offers all kinds of professional features like the ability to simultaneously record 4K and lower quality proxy files on SD cards. It also offers 2 XLR inputs, a professional SDI out as well as USB and HDMI outputs. 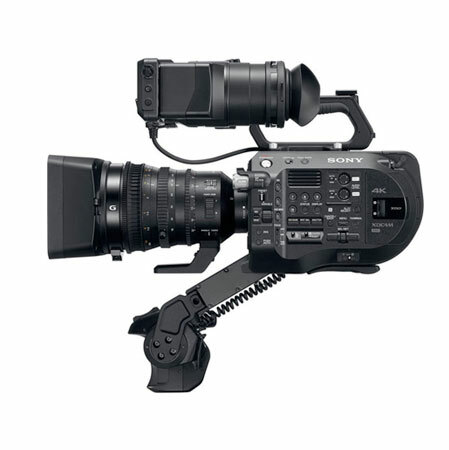 It records in a plethora of formats including many flavors of XAVC (a high quality Sony format) and AVCHD. 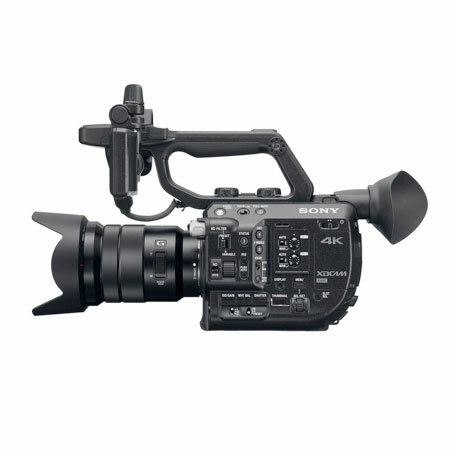 Offering both a top handle for carrying and low angle shots as well as a side grip, the Sony FS5 is ergonomically built for run and gun shooting, while still offering gorgeous DSLR-like images with its large Super 35 sized CMOS sensor. 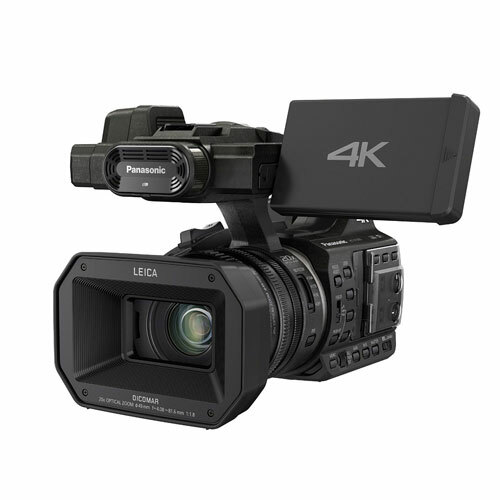 The Panasonic X1000 is also an extremely solid choice for a professional video camera in 2019. 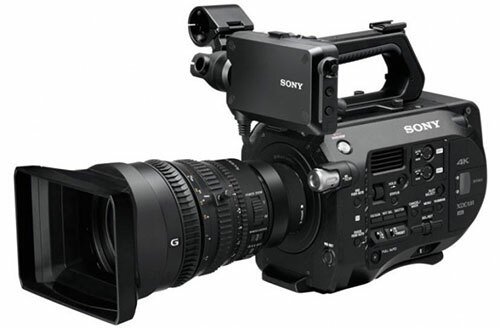 It offers 4K recording at half the price of the aforementioned Sony FS5, and also boasts a more traditional handheld video camera form factor. It also offers two professional XLR audio inputs (interestingly they are on different parts of the left body in a unique arrangement that may prove to be useful), and a full-sized HDMI output for recording with an external media recorder. 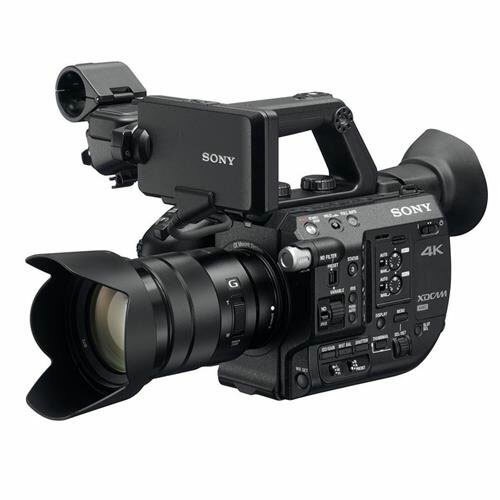 The X1000 records in MP4, MOV, and AVCHD on SDHC or SDXC memory cards and features a side hand grip and top handle for carrying or low angle shots. Holy cow, this is quite a camera. Panasonic started making really solid and respected DSLRs for video with the GH2. 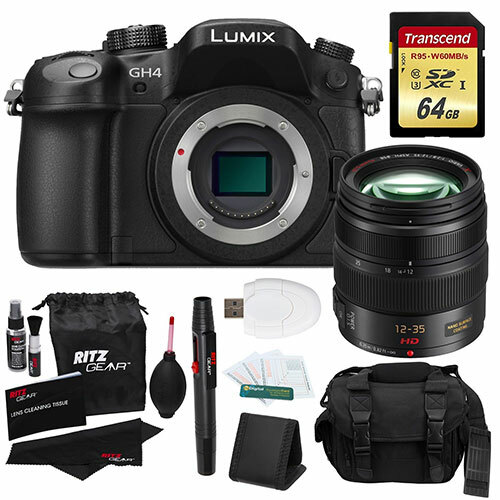 With the GH4 Panasonic added 4K video and the GH5 provides even better quality image processing, and an optional (but pricey) XLR interface that plugs into the bottom of the camera, allowing you to connect professional microphones. The Panasonic GH5 records on cheap SDHC or SDXC cards and you can also buy additional batteries cheaply. Note however that unlike many other DSLRs, this camera is a Micro Four Thirds camera, meaning it uses M4/3 lenses made by a variety of manufacturers. One key advantage of the Panasonic GH series has over some of Canon’s cameras is it has a headphone jack and adjustable audio input instead of auto-only audio levels. It’s not surprising that this small and light camera is turning a lot of heads in the documentary filmmaking community. Check out our recent article titled Why Use Panasonic GH4/GH3 Cameras for Documentary Filmmaking? for more information. Consider the slightly older GH4 model as a budget option with similar technical specifications. 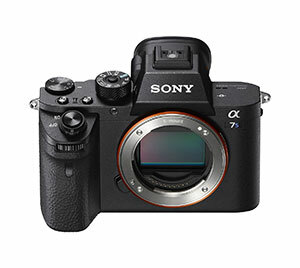 The Sony a7S II is a newer camera than the GH4 and it doesn’t have quite as well a developed accessory ecosystem yet, but it may dethrone the GH4K as the go-to DSLR for documentary filmmakers in 2019. Why? The a7S II offers an extraordinarily good low light sensor, which can be crucial when you’re shooting with available light, as many documentary filmmakers find themselves doing. 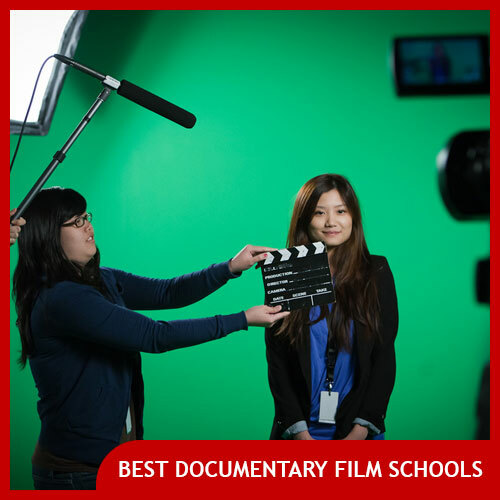 The last category of documentary filmmaking camera is the DSLR-traditional video camera hybrid. What are these strange beasts? 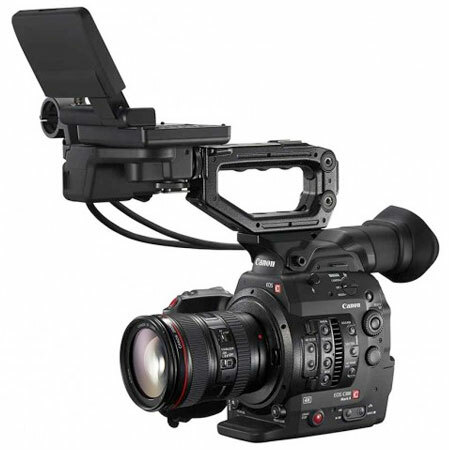 They combine the interchangeable lenses and large sensors of DSLRs (which provide soft background images) with the run and gun ergonomics and XLR audio input capabilities of traditional video cameras. If we had to bet, we would say that these crossover cameras are the way of the future– at least for now. They tend to be pricy-er than either of the above options, and understandably so, but they may represent the best option if you can afford it. The Canon CX10 is a relatively new traditional video camera-DSLR hybrid that is probably going to shoot some great documentary films. While it doesn’t have an interchangeable lens like the Canon C100/300 do, the XC10 does offer 4K at an affordable price, and its large sensor allows for some gorgeous imagery. It also offers extremely high bitrate recording (up to 305 megabits per second in 4K resolution), meaning properly exposed images will look gorgeous. It doesn’t offer XLR inputs but you can easily pick up a DSLR XLR input adapters to add XLR ports.